World Food Programme (WFP): Strengthen national and local capacities for comprehensive management of drought in order to reduce its impacts on water supply and food and nutrition security in Cuba. Movement for Peace – MPDL: Strengthening early warning, adaptation, preparedness and response actions to increase drought resilience and reduce its impact on food and nutrition security, and water supply in Cuba’s eastern provinces. Oxfam Belgium: Enfrentando a la sequía causada por el fenómeno del Nino en la Provincia de Santiago de Cuba. Oxfam Intermón (SSR): Evaluation of drought impact and targeted response to food insecurity in Haiti and the Dominican Republic. Oxfam Intermón (EDF): Integrated EFSVL and WaSH response to "el Niño" via a resilience lens, in the Dominican Republic. The Directorate General of the European Commission Humanitarian Aid and Civil Protection (ECHO) is supporting since 1994 disaster preparedness activities in the Caribbean. The so called DIPECHO programme (Disaster Preparedness ECHO) demonstrates that simple and relatively cheap preparedness measures save lives and are an efficient way of reducing damages. The DIPECHO programme works with the communities who live in areas at risk and those actors in charge of the emergency response, helping them identify and reduce their risks and improving their ability to respond to disasters. Since 1994, ECHO has allocated over €38,3 million to enhance and build community resilience in the Caribbean, an amount that has funded more than 116 projects. This support is included in €118 millon, which was in addition provided for emergency response in the region. In total €332 millon have been given to support vulnerable population in Haiti. The 2015-2016 DIPECHO Action Plan for the Caribbean supports 14 projects (3 regional, 2 bi-ntional and 9 national) with for disaster risk reduction and preparedness activities in a total of 12 countries (Barbados, Cuba, Dominica, Dominican Republic, Haiti, Grenada, Guyana, Jamaica, Saint Lucia, Saint Vincent & Grenadines, Suriname and Trinidad and Tobago). A total amount of total of €9.3 million has been allocated for interventions in the Caribbean for this time frame. The 2015-2016 DIPECHO Action Plan for the Caribbean contributes to the implementation of the Sendai Framework for Disaster Risk Reduction2015–2030 and at regional level to the 2014-2024 Comprehensive Disaster Management (CDM) Strategy coordinated by Comprehensive Disaster Emergency Management Agency (CDEMA) as well as the Saint-Marc Plan of Action as well as the Declaration and Action Plan of Pétion-Ville which is guiding the work of the Association of Caribbean States. The DIPECHO Action Plan aims to contribute to the overall goal of resilience building by providing most vulnerable populations and communities with sound technical solutions to improve their preparedness for natural hazards and by contributing to regional cooperation, exchange of information, capacity building and training. As in the previous DIPECHO Action Plan, the objective is to establish greater collaboration and coordination between partners, allowing programming of common outcomes and the harmonization of practices. In order to facilitate coordination and communication throughout the Action Plan the good practice of creating working groups referred to as Petit Comités, will be continued. Sendai Framework for Disaster Risk Reduction (TOR / Common activities). The Petit Comités will contribute to the implementation process by stimulating collaboration in specific areas and therefore support the accomplishment of expected outputs and outcomes. These partners will work together throughout the DIPECHO Action Plan ensuring that the identified priorities will be followed through; expected results will be achieved and promoted in order to optimize the impact and to allow scaling up. El Plan de Acción Fortalecimiento de la reducción del riesgo de desastres en el Caribe a través de una mayor promoción del Marco de Acción de Hyogo para acciones prioritarias para la acción a nivel local, nacional y regional (DIPECHO Caribe 2013-2014) tiene como objetivo establecer una mayor colaboración y coordinación entre los socios, permitiendo así la programación de resultados comunes y la armonización de prácticas. Por otra parte, se centra en la mejora de la comunicación y difusión de las contribuciones clave de RRD de la región, mediante la recolección de evidencias de éxito respecto a cómo los proyectos DIPECHO han permitido a la mayor parte de las comunidades en riesgo prever, resistir, adaptarse y, a veces, recuperarse rápidamente de los desastres. 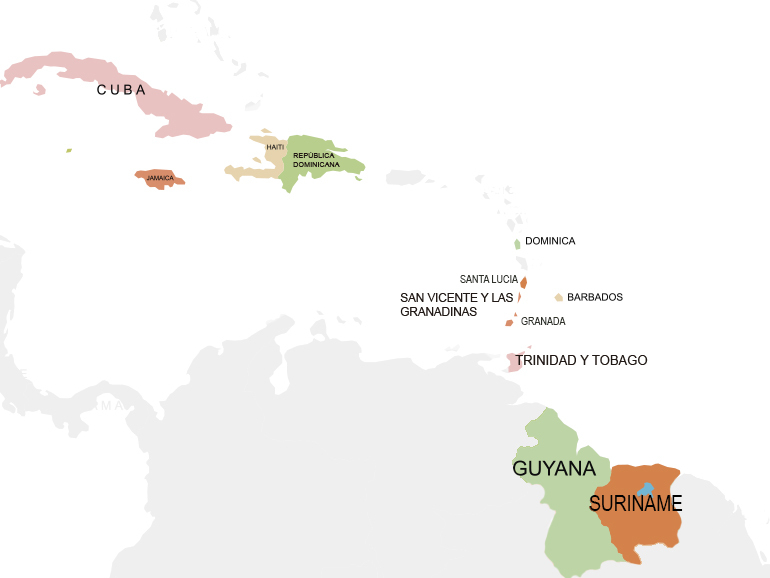 Dentro del Plan de Acción para el Caribe los socios DIPECHO están implementando 14 proyectos en 10 países:Barbados, Cuba, Dominica, República Dominicana, Grenada, Guyana, Haití, Jamaica, Santa Lucia, San Vicente y las Granadinas, Suriname, Trinidad y Tobago. El presupuesto del Plan de Acción se estableció en 8.5 millones de euros. Training material for application of tool "Criteria to identify Key Actions for Disaster Risk Reduction (DRR) Planning in Latin America and the Caribbean"
Report on application of tools "Criteria to identify Key Actions for Disaster Risk Reduction (DRR) Planning in Latin America and the Caribbean"
The 2011-2012 DIPECHO Action Plan for the Caribbean, funded by The Humanitarian Aid department & Civil Protection of the European Commission (ECHO), establishes as one of its components the promotion of a close coordination among implementing partners, allowing the programming of common activities and outcomes as well as the exchange of experiences and tools and the harmonization of practices. Within this Action Plan, 11 projects were implemented. The 2011-2012 DIPECHO Action Plan for the Caribbean webpage promotes the achievements and tools related to Action Plan.